Eaton senior Alysa Sorrell watches as the ball she hit clears the left field fence for a walk-off home run for the Eagles against Franklin. 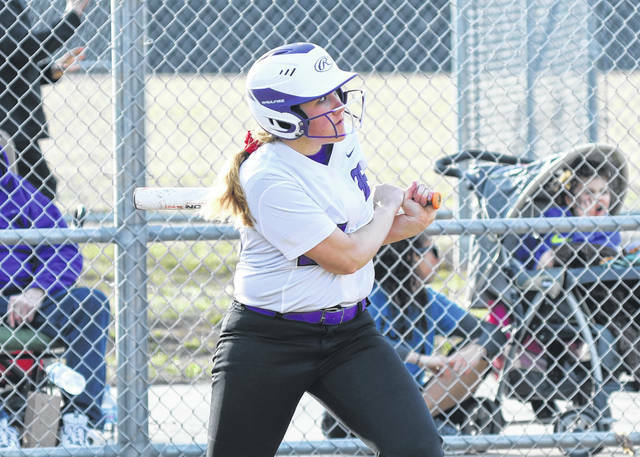 Eaton improved to 3-0 overall and 1-0 in the Southwestern Buckeye League Southwestern Division with a 10-0, 6-inning win on Wednesday, March 27. 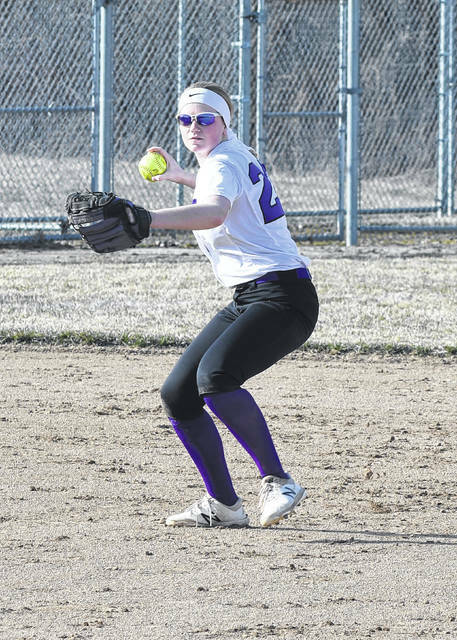 EATON — Carsyn Lammers and Lexi Miller combined to drive in seven runs and Annika Gels tossed a five-hitter to lead Eaton’s softball team to a convincing 10-0, 6-inning, run-rule win over visiting Franklin on Wednesday, March 27. 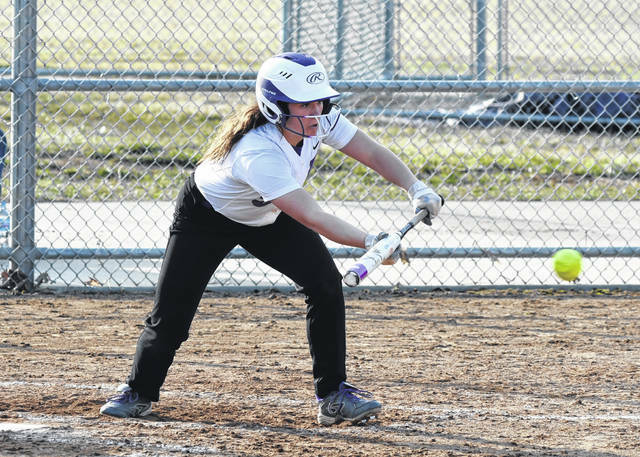 Eaton pounded out 14 hits as it improved to 3-0 overall and 1-0 in the Southwestern Buckeye League Southwestern Division. Eaton got off to a quick start scoring four runs in the bottom of the first — all after two outs. 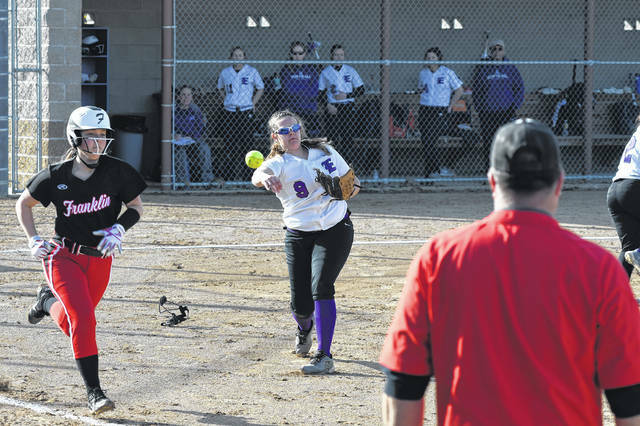 Rilee Worley singled to score Ashley Earley, who reached base on a fielder’s choice. Lammers followed with a single to score Worley and Allison Mowen, who was a courtesy runner for Gels, to make it 3-0. Miller followed with a single to score Lammers. 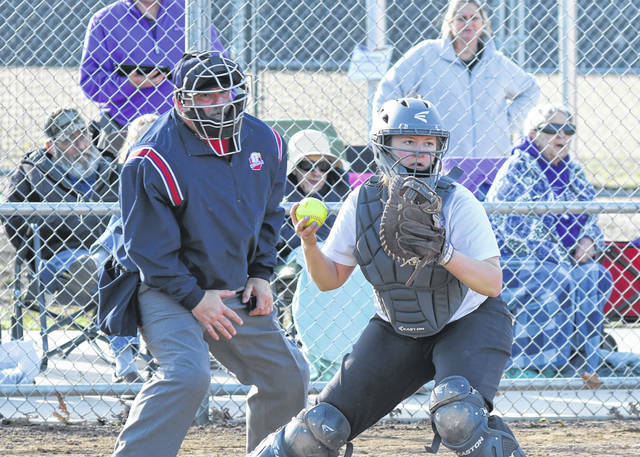 The Eagles made it 6-0 with a pair of runs in the fourth — again after two were out. Earley singled with one out. After a pop out, Becca Mowen reached base via a dropped third strike. 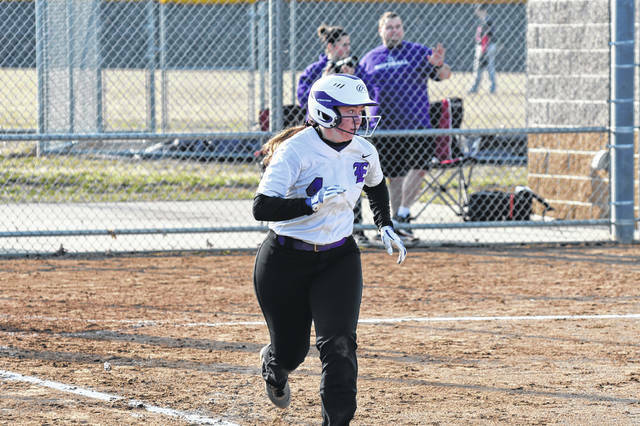 Franklin intentionally walked Worley to load the bases, but Lammers made the Wildcats pay with a single to right to score Earley and Kayleigh Micheal, who was a courtesy runner for Mowen. Eaton added another run in the fifth. Erica Wilkinson singled to lead off the inning and Emily Dungan followed with a bunt single. The next two batters struck out and popped out. Gels then drove in Wilkinson to make it 7-0. In the sixth, Lammers singled and scored on a home run by Miller to make it a 9-0 game. Alysa Sorrell followed with a home run to end the game. Lammers, a sophomore, went 3-for-4 with four RBIs. Miller added three hits and drove in three runs. On the mound, Gels struck out 12. The Eagles had games with Tri-Village and Coldwater as well as a second game with Franklin canceled last week due to poor weather conditions. 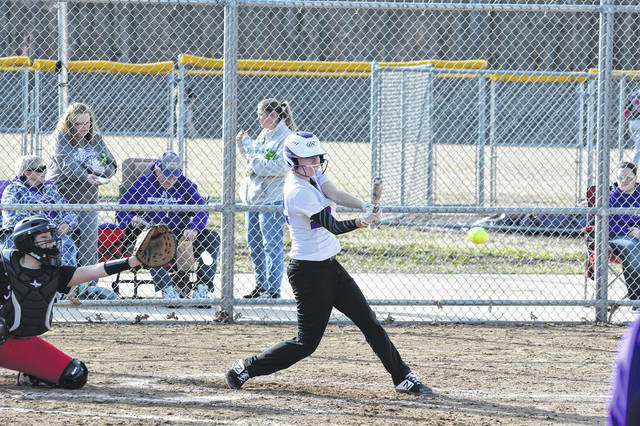 Eaton was scheduled to play Bellbrook on Monday, April 1 then will meet Brookville for a pair games later in the week. Eaton is scheduled to travel to Brookville on Wednesday and host the Blue Devils on Friday. Both games will have huge implications on the league race as Eaton and Brookville are two of the teams expected to challenge for the division title, along with defending champion Monroe. 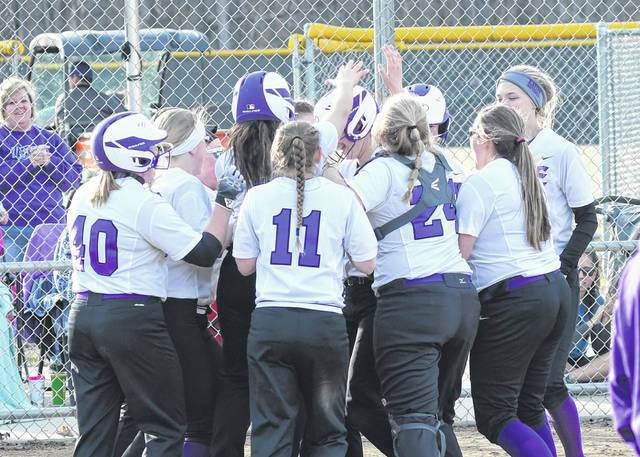 https://www.registerherald.com/wp-content/uploads/sites/41/2019/04/web1_ehssb9.jpgEaton senior Alysa Sorrell watches as the ball she hit clears the left field fence for a walk-off home run for the Eagles against Franklin. 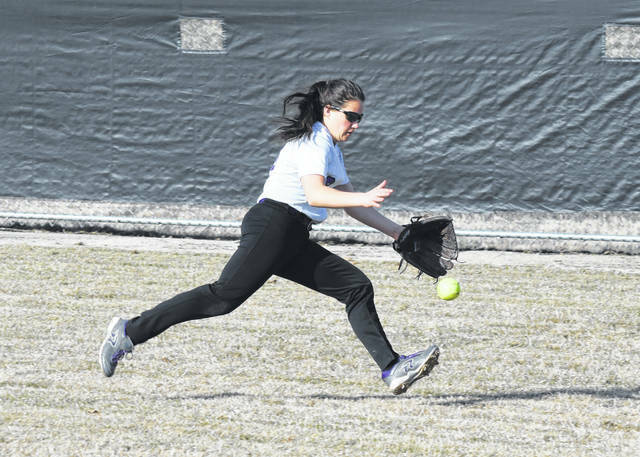 Eaton improved to 3-0 overall and 1-0 in the Southwestern Buckeye League Southwestern Division with a 10-0, 6-inning win on Wednesday, March 27.